The legendary Cornell Professor Milton Konvitz, Ph.D. ’33, encouraged students to explore the origins of ideals embedded in the U.S. Constitution to understand civil rights and civil liberties. 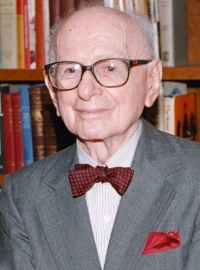 He referenced principles of intellectual history in such lectures as “The Hebrew Bible,” “Antigone” and “Revolution” in his “American Ideals” course, first offered in 1947. Audio from 44 “American Ideals” lectures that many Cornellians say shaped their lives is now available online through DigitalCommons@ILR. In honor of Konvitz, Joan Jacobs ‘54 and Irwin Jacobs ‘56 founded ILR’s Konvitz lecture series in 2006. This year, mediation and alternative dispute resolution expert Kenneth R. Feinberg of Harvard Law School will speak about “Unconventional Responses to Unique Catastrophes: Tailoring the Law to Meet the Challenges ” April 25 at 4:30 p.m. in Room 105 Ives Hall. It is free and open to the public. In 1933, Konvitz graduated from Cornell with a doctorate in philosophy. He worked at the NAACP Legal Defense Fund before joining the university, where he taught at the Law School and founded Cornell's Department of Near Eastern Studies and its Program of Jewish Studies. He was a founding faculty member of the ILR School, which held its first class in 1945. For decades, Konvitz worked with the Republic of Liberia as it established its laws. He also edited opinions of the Supreme Court of Liberia. When he gave his last “American Ideals” lecture, in 1974, more than 8,000 students had taken the course, including U.S. Supreme Court Justice Ruth Bader Ginsburg ’54. At the end of the lecture, Konvitz called the course “part of the very tissue of myself."